Plenty of people turn to social networks like Facebook and sites like Twitter for fun. And plenty of folks turn to these tools because of the boost they can give their business. These business-oriented users, especially the ones who manage multiple Facebook pages, Google + Pages, and Twitter accounts, are the ones who will benefit most from HootSuite, a cloud-based service that offers a potent set of social media management tools. HootSuite organizes your social media accounts into tabs, and within those tabs, it presents information in streams. HootSuite is available in two plans: Basic, a free (but ad-supported) version that includes five social profiles and two RSS/Atom feeds, as well as quick reports, and Pro, a $6/month ad-free plan that includes unlimited social profiles, one free team member, one free enhanced analytics report, integration with Google Analytics and Facebook Insights, and the ability to archive tweets. Rival TweetDeck, which is available in both a desktop and Web-based version, is free, while Web-based SocialOomph offers a free version and a paid version that starts at about $30 per month. Not only does HootSuite's price compare favorably with its rivals, so, too, does its feature set. Like both of these competitors, HootSuite makes it a breeze to update your status across multiple services, schedule updates for future posting, track your @mentions, and more. It also includes support for a variety of social networks, such as Twitter, Facebook, LinkedIn, Ping.fm, Wordpress, MySpace, Foursquare, and mixi. TweetDeck, meanwhile, recently discontinued support for LinkedIn, leaving it with Twitter and Facebook only. SocialOomph's free version supports only Twitter, but its paid subscription adds support for Facebook and various blogging services. Using HootSuite is quite easy. You add the accounts you'd like to include, and the browser-based HootSuite creates a tab for each one. 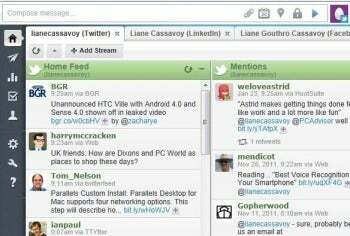 Within those tabs, HootSuite features a column-style interface that's similar to the layout of TweetDeck, though instead of columns, HootSuite calls them "streams." You can add streams of information for each of your social network, such as your Twitter Home Feed, incoming Direct Messages, outgoing Direct Messages, and more. Streams can be rearranged simply by dragging and dropping them to a new location. Where HootSuite really sets itself apart from the competition is in the analytics tools that it offers. It allows you to see how well your social media campaigns are working by letting you track clicks, see referring Web sites, and measure the impact of individual tweets. You can use this information to create reports that can be shared with others, which is helpful for business users. HootSuite is an attractive, easy-to-use, and powerful social media manager. Its full suite of tools will likely prove too much for casual Facebook or Twitter users, but social media pros will appreciate all that it has to offer. Manage your Twitter, Facebook, and other social media accounts with this Web-based application.